heads a sinister organization known as the Order and attempts to gain control of the device for his own evil means. I tried to incorporate romance, suspense, and adventure to my story the best way I could such that the reader would want to turn the page and see what happens next. In addition to exploring how one’s real life may experience different realities, the reader may also discern a cautionary tale regarding consequences of new technology and taking precautions so that it will not fall into the wrong hands. I hope that such a tale will highlight that there must be a sense of conscientiousness among every individual (no matter which dimension they are in at the moment). Conscientiousness may have gone wayward in today’s society where celebrity and wealth are revered while the needs of the isenfranchised tend to be unfortunately neglected. Therefore, I also wanted to include this awareness into my story by exploring how the less fortunate are treated in different dimensions and allow the reader to differentiate between these treatments. In all, I hope that Order of The Dimensions, as similar works related to the multi-dimensional theory piques an interest among readers and leads them to think about how their lives may be affected in different dimensions if multiple dimensions indeed exist. As an additional point, I hope to bring an awareness of treating individuals, particularly the disenfranchised, with respect in any dimension. Lastly, my wish is that the reader can exercise their own imagination using my story and remember those childhood times when he or she liked playing pretend and believed that anything was possible. 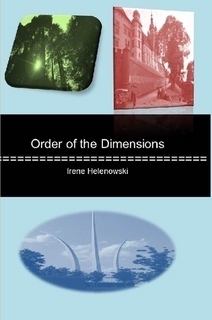 For information on author Irene Helenowski and Order of the Dimensions, please visit her Facebook page. To read my review of Order of the Dimensions, go here. To purchase a copy of Order of the Dimensions, go here. I am an Amazon affiliate. I will receive a small commission if you make a purchase through my link.